For the fifth year, Tech & Learning presents its awards program that honors great products at ISTE 2018. 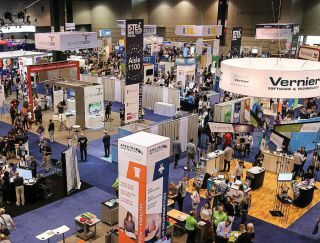 The products below were selected by an anonymous panel of educator judges, who scoured the exhibit hall floor during the conference in Chicago. The judges rated their impressions on a sliding scale, evaluating areas such as quality and effectiveness, ease of use and creative use of technology. They then met in person to decide which technologies will have the most impact in the classroom and deserved to be named Best of Show. Please join us in congratulating the following winners. The Acer Chromebook Tab 10 will be used in classrooms to expand and enhance student learning. Its portable design enables it to be used comfortably by younger children and in more environments. It also supports Google Play educational apps, so students can collaborate, discover, engage and learn, and includes a Wacom EMR stylus that lets students use interactive apps, sketch, take notes, and capture ideas. It also features dual webcams, long battery life, and more. The Acer Spin 5 is a convertible Windows notebook PC line with a variety of options to meet administrator, teacher, and student needs. Available with either 15.6-inch or 13.3-inch Full HD touch displays, all Spin 5 models have a 360-degree hinge that allows four usage modes (laptop, tablet, display, and tent). The line supports up to 8th Generation Intel Core processors, up to 16GB of DDR4 memory, many storage options, and more. Achieve3000 Pro offers a patented instructional model that combines summative and embedded formative assessments to differentiate content and instruction, so students always see lessons at their just-right reading level. Access to content in 12 Lexile levels in English and 8 levels in Spanish with customizable learning and language scaffolds means all students in a class can participate together in grade-appropriate learning, regardless of their level of reading ability or stage of English language development. Amplify Close Reading is a digital graphic novel adventure for grades 5–8 that engages students in a suspenseful story while developing close reading skills and confidence. Titled “The Last Readers,” the novel’s setting is a dystopian future world run by machines that control what people read. Students rebel by learning the powerful ways authors convey meaning and affect their audience. Judges loved the concept of a story being used to inspire kids to close read. Tinkercad is a simple, free online design tool used to create and print 3D models, as well as for building and testing electronics. From a complete 3D design, you can export to a 3D printer, make it into blocks for Minecraft, or get step-by-step build instructions for bricks. Judges favored the app’s creative power and liked that a 3D printer wasn’t necessary to create objects that could be imported into MineCraft worlds. The AVer CP3 Series Interactive Flat Panel lets users instantly access thousands of apps for education, promote safe learning with screen and app lock, effortlessly pull up PDFs from the cloud and import them into the feature-rich whiteboard, and more. The Flat Panel also features an upgradable built-in Android Module and wireless AVer document camera integration. Judges liked the built-in Android feature, its easy set-up, and the availability of multiple ports. wePresent’s WiCS-2100 is a simple to use wireless presentation collaboration solution that allows presentation, interaction, and collaboration between users with any BYOD device. WiCS-2100 offers an eco-standby mode, allowing for reduced power consumption without compromising any performance or reliability. Other features include complete integration with Chromecast and AirPlay devices, interactive whiteboard capabilities, dynamic screen layout, and a conference controller. Judges liked the moderation and control features, the Chromecast and AirPlay integration, and the BYOD functionality. The Hummingbird Robotics Kit is designed to grow with people who may start as absolute beginners, and to allow them to go deep in many different ways — whether by creating beautiful electronic art, intricate cardboard mechatronics, or cleverly programmed robotic behaviors. The next generation of Hummingbird, powered by micro:bit, allows for projects to be untethered and works with all devices with both blocks and text coding. Judges appreciated its innovation and affordability. The MimioSpace collaborative system consists of a laser projector, touch board, and Mini-PC, creating an expansive 32-touch area with Touch 360° interactivity. Students work together in an area almost 11 ft wide and over 4 ft tall, making collaborative learning at the front of the classroom a reality. Judges loved the collaboration space, the feel of the surface when writing, and the product’s ability to aid in the integration of the 4 C’s of teaching. The BrightBytes Early Insights suite, consisting of the Student Success and Intervention modules, provides organizations with a comprehensive system to ensure at-risk students are identified early, accurately, and connected to the most effective programs for success. The Early Insights suite utilizes advanced predictive analytics to identify, connect, and monitor students across multiple locally-validated risk indicators throughout the K-20 continuum. Judges were impressed by BrightBytes’ consistent ability to move districts in positive directions with its products. The Learning Outcomes module captures millions of data points from any digital device usage, and triangulates it with district investment data and student achievement data. The module goes beyond tracking app usage, and uses advanced data analytics to help educators discover which programs have the most influence, and inform plans to replicate, scale, or adjust resources accordingly. Judges were impressed by BrightBytes’ continued dedication to improving education technology for the benefit of entire school districts. The Bluetooth Jackbox supports Bluetooth 4.0, has an internal rechargeable battery that supports up to 12 hours of playtime and includes a 3.5mm jack to link another jackbox for added listeners. This device can be applied across a variety of activities, from literacy groups to ELL lessons. Judges liked the Bluetooth streaming functionality, its mobility, and its audio capabilities, allowing up to 6 users at a time to use it with headphones. Califone’s 1017 series of headsets and headphones are a versatile, cost-effective solution for teachers seeking to implement listening activities into the classroom through Chromebooks, computers, or mobile devices. Equipped with an in-line volume control wheel, unidirectional washable microphone, and ‘CaliTuff’ durable cords, these headsets and headphones are built to last while providing quality sound. Judges liked the childproofed headphone and headset, the product’s user-friendliness, and the system’s ability to let students create their own podcasts. IGS Pro is a new and advanced version of the Intelligent Grading Solution (IGS). The solution allows teachers to conveniently create and grade tests aligned with Learning Objectives, review student and class performance based on Benchmarks, generate analytical reports and export grade books pre-formatted for LMS input, and much more. IGS Pro leverages all the current features of IGS, granting educators the flexibility to leverage MFPs while extending access via a cloud-based interface, anywhere, anytime. CatchOn is an administrative tool that provides a real-time digital inventory for district technology leaders on all apps, software, and website activity. CatchOn’s dashboard and reports provide 100% visibility of activity on all devices, enabling administrative leaders to assess the success of technology initiatives and prescribe professional development on a per-campus level based on actual usage data. In addition, CatchOn helps district administrators mitigate student data privacy risks associated with unknown tool usage. ClassLink Analytics provides district leaders the usage insight they need to make informed decisions about the digital learning resources and business tools they choose to invest, while keeping track of how often district resources are used and by exactly which groups, classrooms, and individual users. ClassLink Analytics helps administrators sort and compare schools, download reports, and modify their dashboard view so they see the most important details, and it also features a downloadable mobile app. ClassLink OneSync is an account provisioning software that automatically imports student information system (SIS) and human resources user lists into Microsoft Active Directory, Google Directory and Office365. OneSync lets IT teams ensure teachers, students, and staff have valid login accounts that work reliably and to clean up unnecessary accounts. When combined with ClassLink Roster Server, OneSync allows schools to provision login accounts into O365 and Google and create groups in Microsoft Teams and Google Classroom. codeSpark Academy with the Foos introduces little learners as young as four to fundamental computer science and coding concepts through interactive puzzles, games, and step-by-step creative projects. The word-free interface allows anyone, anywhere to play. After mastering the basics, kids can apply their newly developed skills in Game Maker, where they design, code, share, and remix games with their peers. Judges loved the game’s creativity and its accessibility for students still learning to read. The CTL Chromebook NL7TW is CTL’s latest convertible 360 Chromebook incorporating Intel’s next generation of processors. In addition, the NL7360 supports USB C, World Facing Cameras (Dual), and Gorilla Glass. The NL7TW incorporates pen-based input from Wacom that allows the users to have the best experience in tablet and clamshell model. The Wacom pen is pressure sensitive and produces an accurate pen experience. Judges liked the 2-1 capabilities, the integrated handle, and the add-on case. The Dell Latitude 3190 and Latitude 3190 2-in-1 Education series, delivered in two form factors — the 11-inch laptop and 2-in-1 convertible — are learning devices built with enhanced durability to withstand tough school environments. Both offer learning tools such as Windows 10 Pro and a suite of Microsoft Office programs while the 2-in-1 specifically offers multiple modes to adjust to every learning need. The judges recommended the 2-1 for its construction, strength, and approachable price. Edmentum Exact Path utilizes adaptive diagnostic assessments paired with individualized learning paths to ensure academic growth in K-8 reading, language arts, and math. Each assessment automatically creates a unique learning path of high-quality digital curriculum to support a personalized learning experience for learners of splintered abilities. Judges liked its ability to address any student learning deficiencies by connecting the dots between a student’s results and activities. They also liked its teacher dashboard and software interfaces. Gizmos are online simulations that help students to make connections and draw conclusions with an interactive design that supports a manipulation of variables and “what-if” experimentation. Every Gizmo comes with extensive teaching resources that help make planning and teaching easy. Gizmos help prepare students for rigorous new standards and online assessments. Judges liked that the product provided immediate feedback on both correct and incorrect answers and its adhered to Common Core and state standards. Reflex is an effective system for mastering basic facts in addition, subtraction, multiplication and division. Reflex uses fact families and delivers the right facts at the right time to each individual student, meeting students where there are. As they progress, students must make fast decisions and answer math facts to play the games, ensuring that their math facts become automatic and fluent. Judges liked its cross platform and device functionality and its teacher dashboard. The GlobalViewer Campus Communication Suite is a complete solution for unifying all campus audio systems under an easy-to-use interface. The suite leverages the power of an existing network to provide bells, public address announcements, and intercom communications throughout the campus. Judges liked the product’s capability to remotely manage bells, being able to create flexible schedules, and the Intercom over network feature that provides two-way voice communication between classrooms and the office or help desk. StudioStation is a simple solution for one-touch recording of high quality video and audio presentations. By simply inserting a USB storage device and pressing a button, the system is ready to record. Remove the USB storage device to place the product in standby mode and turn off any devices connected to its power controller. Judges liked the support of a wide range of resolutions and video quality and its ability to create MP4 video. Collections by Destiny allows Follett customers to create new, collaborative ways for librarians, teachers, and curriculum staff to share free or purchased resources across the district, schools or between users. Collections showcases resources purchased and curated through the library staff, allowing librarians to wrap content around what teachers are currently covering in their curriculum. Students can save an ebook for a book report, their own created content, or more for sharing with their teacher. The Frontline Education skill for Amazon Alexa provides easy, on demand access to critical data and actionable insights, hosted on AWS, through Alexa-enabled devices, allowing education leaders to make informed decisions about attracting, engaging, growing, and retaining educators. Judges like its innovative “Jetsons’ like” use of voice activated tech and the possibilities it could bring in improving the lives of administrators. The HoverCam Pilot 3 is a fully integrated wireless digital teaching station. Featuring a Windows PC, 13MP document camera, and 21-inch touchscreen with wireless HD mirroring functionality in a mobile podium. It eliminates the outdated AV cart and combines the most important elements used in today’s digital classrooms. It also features a built-in microphone, interactive whiteboarding, and more. Judges liked the all-in-one system, the upgradeable components, and appreciated the teacher flexibility and mobility it provided. CoderZ is an online platform that teaches students in grades 6-12 valuable STEM skills. Its interface is fun and uses virtual robots for both beginners and experts, offering a simple, Scratch-like language called Blockly for new coders or allowing advanced students to work directly with Java code. Judges liked that its online platform helps educators avoid the typically prohibitive costs of robots by providing virtual robots that are equally engaging when teaching students to code. The LapCabby ZIP is designed to secure and charge 8 Chromebooks with ease. The durable, heat resistant material bag incorporates simultaneous charging capabilities and a detachable trolley ensuring devices always travel safely. LapCabby features soft, heat proof material lining and dividers, ventilation throughout to ensure airflow, clever cable management, a lightweight bag and trolley, lockable zips for ultimate security, and more. Judges liked the product’s mobility, its built-in powerstrip, and the rolling cart’s design. Lexia PowerUp Literacy enhances core English language arts instruction for non-proficient readers in grades 6 and above who lack the literacy skills critical to succeed in college and careers. PowerUp addresses the needs of a variety of students, from struggling to nearly proficient readers, by identifying skill gaps and providing personalized, systematic instruction in Word Study, Grammar, and Comprehension. Judges liked that it provides tools to help middle school teachers individualize instruction for every student. Mango Classroom by Mango Languages provides students with real-world content, authentic native-speaker audio and linguist-backed learning tools to comfortably and confidently practice and apply language skills in the classroom, the community, and beyond. Judges liked its comprehensive setup, that it uses native speakers in over 70 different languages to help students learn as early as 4th grade, and favored its intuitive, culturally grounded system that makes it easier for teachers, students, and parents to navigate. EXTREME SHELL 3.0, MAX INTERACTIVE, INC. The Max Extreme Shell 3.0 safeguards your investment with two layers of shock-absorbing, co-molded polycarbonate material on the top and bottom of case. It features asset tags, a heat dissipation bottom, nonslip base, a case opening aligned with one’s device, easy snap-on design with ergonomic finger lip for easy opening of your laptop, customizable options, and more. It fits all charging carts. Judges like its preservation features, personalization options, and the asset tag’s visibility. Peachjar is a cloud-based digital flyer management tool. Schools can utilize irs colorful flyer templates to quickly create, upload and distribute visually engaging flyers directly to parents’ inboxes and to each school’s website. Additionally, community organizations can upload their flyers for digital approval and distribution. Schools that use Peachjar see an increase in parent engagement since digital flyers can include a variety of call to action buttons and can be accessed anytime, anywhere. The pi-top Learning System is a complete “Learning by Making” experience & mobile makerspace that creates an engaging & robust computer science curriculum. Powered by a suite of 30 devices and peripherals, a charging cart, software, exclusive curriculum, teacher training, and a limited lifetime warranty, the pi-top Learning System includes the pi-top Innovation Challenge, a multidisciplinary technology program with a highly engaging, student-centered approach that enables students to apply physical computing & solve challenges centered around real-world topics. ActivInpire is a collaborative lesson delivery software for Promethean’s interactive displays, providing educators with differentiated lessons, creation tools, and activities to bring their lessons to life. With ActivInspire, teachers can create interactive lessons, get access to powerful engagement tools such as spotlight focus, magic ink, and equation editor, increase collaboration, and more. ActivInspire is available to use on Windows, Mac, and Linux operating systems. Judges liked the collaboration ability. Promethean Escape Room is a simulation that walks teachers through effectively implementing Promethean’s technology solutions in an out-of-the-box way. During the simulation, a group of participants is given a challenge to solve. In order to solve the challenge, the group is tasked with completing various puzzles that integrate Promethean’s technology. Judges liked that it inspired teachers to create unique activities for students to help them also think in new ways. Renaissance myON Reader is a student-centered, personalized literacy program that gives students access to more than 6,000 enhanced digital books. Students can read at school or at home on any internet-enabled device. Titles are dynamically matched to each individual student’s interests, grade, and Lexile reading level. myON Reader includes a healthy mix of fiction and nonfiction content from Capstone Publishers and over 50 other third-party publishers. Renaissance Star 360 delivers the valid, reliable screening, progress monitoring, and student growth data educators need to make informed decisions. Educators see precisely what students have mastered, the goals they need to reach, and optimal paths to proficiency. In addition, Star 360 includes Renaissance Star Spanish to give educators the insight needed to determine the best instruction to meet the needs of Spanish-speaking English Learners. Filter by securly:// is a cloud-based web filter solution on the market designed specifically for K-12. Filter deploys in minutes, doesn’t require hardware, integrates seamlessly with any identity provider, and works with all devices, including iPads, Chromebooks, PC, or Microsoft-based. Its AI uses sentiment analysis to scan for self-harm and bullying messages across social media and web searches. With Pagescan built into the backend, Filter’s blacklisted sites are updated daily before students know they exist. ChromeTools by TechPilot Labs provides cloud-based management tools for teachers to view and control Chromebooks in the classroom, keeping students on-task. Teachers can immediately view student screens, lock students to one or more websites, freeze student screens to gain attention at the front of the room, remotely open sites for an entire class or remotely close unwanted tabs on student devices. Judges liked its Chrome and IOS management and its favorable pricing. Yanshee combines an advanced AI interface, a programmable Raspberry Pi card, and a host of sensors and functionality that create the ultimate open source robot. This allows students to leverage multiple coding languages — including C, C++, Python, Java and Blockly — to engage with Yanshee. The robot features facial, gesture and voice recognition and activation, speech-to-text functionality, and a built-in 1080i 8-Megapixel camera. Judges liked its capability to challenge older students with advanced coding. The UKIT curriculum is designed to teach STEM (Science, Technology, Engineering, Math) concepts and skills students should know and be able to demonstrate at their grade levels according to the standards. The UKIT curriculum also ties STEM literacy into each unit through a literacy prompt that exemplifies the connection between the lesson content and real-world application. Judges liked its applicability to all students and considered the curriculum and activities well thought out. Go Direct Sound provides students with an easy way to capture and evaluate waveforms. Measure wave amplitude and sound intensity level at the same time to investigate the decibel scale, or take the sensor outside the classroom to discover sounds in their natural environment. The rechargeable battery offers long battery life. Judges liked its accessibility, approachable price, battery life, its multi-device and platform compatibility, and its capability to fit into a variety of science classes. The ViewSonic NMP660 Chromebox can transform any Google classroom into a collaborative learning hub and offers quick out-of-the-box set-up, integrated Google management, and built-in security features. The NMP660 facilitates presentations and brainstorming–even when students are in different locations. Security features include automatic updates, verified boot control, data encryption with a TPM module, and a simple recovery process. Judges liked its overall size, number of external inputs and accessibilities, mobility, and bluetooth and wireless access.